The anticipation of this Gi arriving to my house was through the roof. When it finally arrived, I was absolutely blown away. This Gi is top of the line stuff. Amazing quality and amazing design. The colors contrast beautifully, the top is extremely light and that pants are just outright phenomenal (the virtually non-existent belt loop system is drool worthy). The tailored fit of the tops and pants is exceptionally slimming on me. At $149 it’s not the cheapest Gi out there, but for the construction quality and beautiful design, I think it stomps all over the retail prices of Shoyoroll gis right now. Gi Reviewed: A2 on a 5’10” 195lb frame. The Gi is a very light Pearl weave that is soft on the inside and relatively scratchy on the outside. I think Omega Maniac got the jacket perfect for those looking to impede your opponent while feeling comfortable yourself. An opponent likened it to “sandpaper”. The jacket is a slimmer tailored fit that looks tailored to my body (when I’ve skipped Chipotle for lunch). Much like a lot of Gi’s lately the sleeves are quite slim at the wrist and throughout the arm, but no impediment of movement was experienced by me. I was skeptical of the small orange collar accent turning out well, but have to put the skepticism to rest because it looks GORGEOUS. I thought it would look overdone, but it doesn’t. 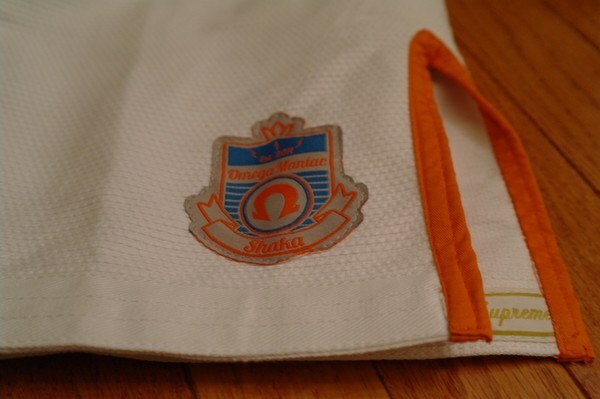 The logos on the sleeves (embroidery) and on the front part of the skirt (patch) are simple and aesthetically pleasing. The inside seam taping on the skirt and sleeves look clean and I had zero issues with scratchiness. I found the collar to be of decent thickness, very average for the Gi’s weight. Looking for other pearl weave gi alternatives? Visit Hypnotik now! I have experienced crappy belt loop systems before, I dread testing any new “innovative” belt loop system. The Omega Maniac Shaka & Vibe belt loop systems smacked me across the face and made me a believer. There are no loops, the rope runs all the way through and you tie it in a small space in the front. It doesn’t bunch and stays together well. Overall these pants are my hands down favorite of any Gi I have ever worn. Ever. They don’t restrict my movement at all while still being slimmer to the leg than most companies. The crotch is reinforced with a pearl weave gusset but maybe much more intriguing are the knee reinforcements. These bad boys are reinforced with the same Pearl weave on the jacket and with a great amount of overall knee coverage. Of note, the pearl weave is on the INSIDE of the pant facing outward, so you can’t see that it’s pearl weave until you look inside the leg, and the soft portion of the weave rests against your skin. I really do detest having to readjust/pullup/retie my pants constantly during class and the Shaka stops me from having to do that. These pants easily outclass my Rio Koi pants in every way. 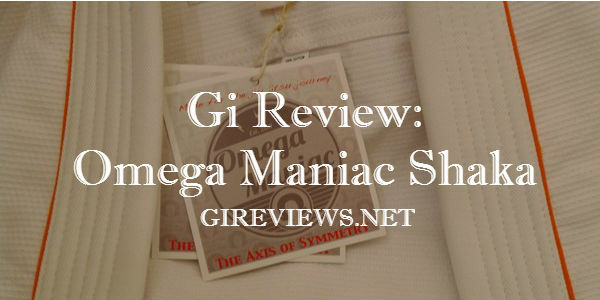 As an active BJJ practitioner I actually feel compelled to thank Omega Maniac for doing such an awesome job on this Gi, because of how much effort I believe went into making sure that BJJ players concerns and needs were addressed. This Gi has skyrocketed right to the top of my rotation in the #1 spot. It also comes with a Gi Bag. I love me some Gi bags. A single side strap that is your standard industry size. I’ll toss in my .02 here simply because I want to second, or third as the case may be (chiming in after Dan), the sentiment that the GR.net guys put out there about Omega. They were excited about this company for all the right reasons. 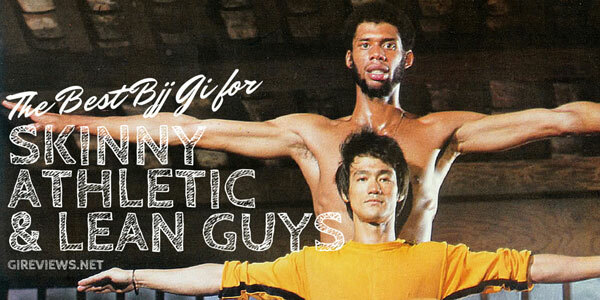 Like many of you, I’ve had more gi’s than I can count. At one point, I had almost 30 gi’s hanging on two racks in my wine cellar. I had no other place for them. 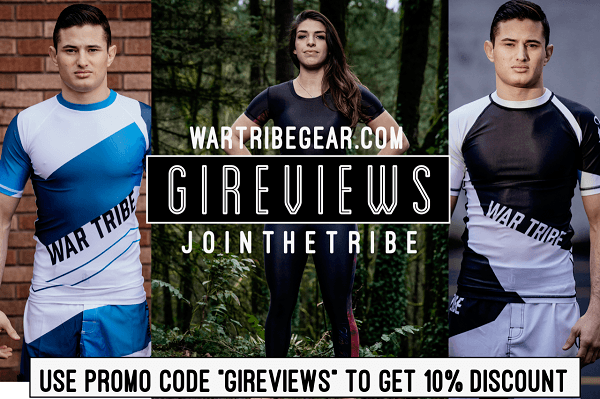 I started buying them site unseen based upon looks, and so that I could make sure that I always had a clean gi ready to go, and having so many made sure that they didn’t get worn out. I had a Master level Brazilian living with me at the time, for a period of a few years, so training was frequent. Then I got injured. I ended up selling some, donating the majority because I thought at the time, my training days were over. Fortunately they weren’t. 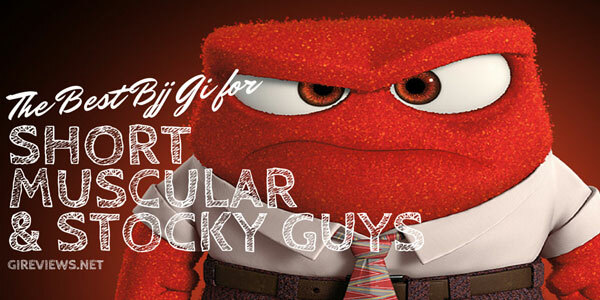 I’ve said all of that to say, that I’ve developed a definite opinion on gi’s and how they fit, and what I can use them for. I’m as hard on my gi’s as my opponents. I’ve been fortunate to have only three instructors since 1995, two of them very senior Brazilian’s, and one Roberto Traven black belt. All of them are huge proponents of using gi lapels as an offensive weapon. 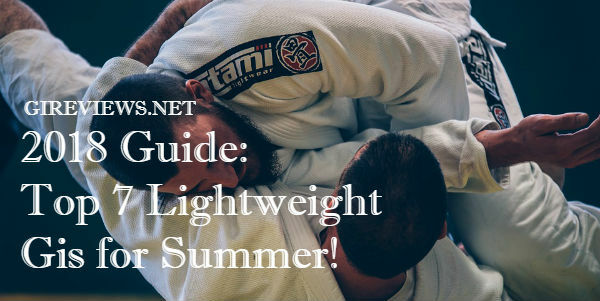 If lightweight is your thing, check out these BJJ gis at Amazon! I love gi’s that walk the fine line between flashy and sterile. I think that the manufacturer that finds that balance, finds a strong gi that will not get old; and I will look forward to wearing it. I can say that without a doubt that my new Omega Maniac Shaka fit’s that bill better than any gi I’ve ever owned. It subtle, yet the orange seams are loud. The fit… The Shaka is the first gi I’ve ever owned that fit me right out of the bag. And I’m 6′, right at 200 pounds. I guess my arm length is typical for someone of that size. The sleeve length is right at the point that if they were any longer, I’d shrink it. So that leaves me a little room to play with if I think that I want shorter sleeves. The only thing that has me thinking that I might try and shrink it ever so little is the shoulder area. 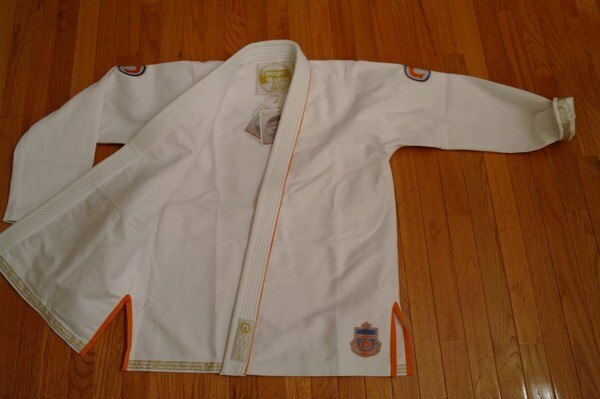 I’ve fairly broad shoulders, yet right at the front of the shoulders, the gi seems just a little puffy. 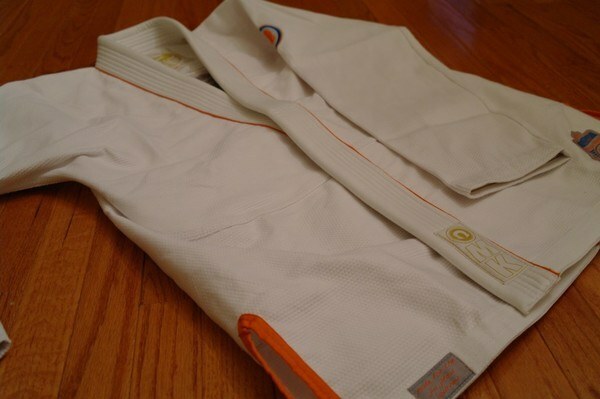 Realize, I’m splitting hairs here; simply because this gi fits so well out of the bag that I need to pick at something! The Omega logo’s on the sleeves are just right. The stand out just enough to be seen, but they’re far from overwhelming and overly flashy. I like them very much. The pants: I have a 34 inch waste, 32 inch inseam; and if I had had these pants made from a tailor, they would not have fit any better. The pants looks simply excellent. The blue drawstring is, like the rest of the gi, subtle yet strong looking. The drawstring system is the best I’ve ever seen. Far better the typical loops. I will purchase the Vibe soon I am sure. If you’re even halfway considering an Omega gi, do not hesitate, you will NOT be sorry. Update (3/23/2017): This gi is no longer available for purchase. It absolutely is Todd, easily my favorite Gi right now, I can’t stop wearing it which is a problem since I have other Gi’s I need to review! Being 170 and 6’1 should i go with an A2 or try an A2s? Good question, lester. The a2 may be a bit short on you as it fits Dan well and he’s 5’10” and 185 (I believe). I’d say go with the a3 and shrink the heck out of it. That’s what I do and it fits much better in length now. The width will be a lot for you, however. I think the a2slim will be way too short. If you want to cold wash, then go A2. Either way, if you get it and it doesn’t fit well, I’m sure JR will work with you on it! I think the A2 would be too short in the sleeves for ya. Do they have an A3 slim?